This entry was posted in Uncategorized and tagged language, Translation by christao408. Bookmark the permalink. Something like this or even worse than this are often seen in Mainland China. In Hong Kong, most English translations are excellent. Since it is garbled in both languages I would ignore it lest the scalp become irritated. What? I cannot even begin to imagine what that is supposed to mean. Hey do you live in Phuket? I was going to live there once. 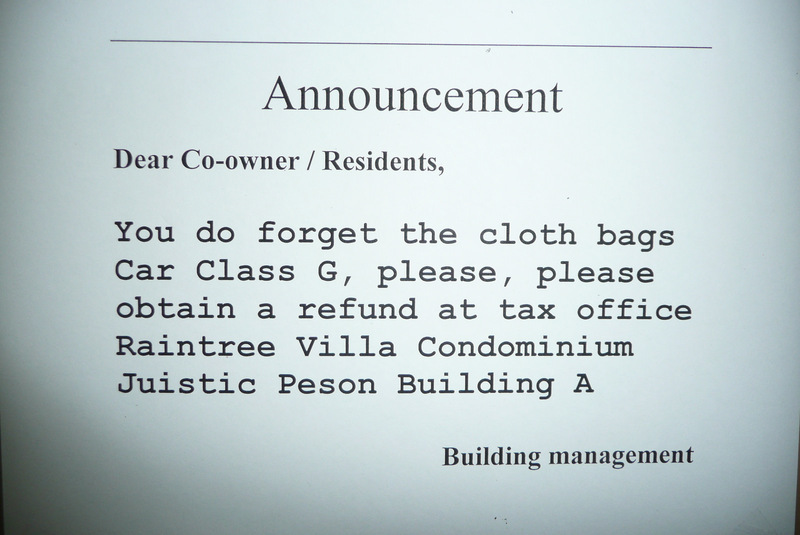 I love the bad English – not good live long English!! @choyshinglin – There is, of course, the Engrish.com website, which has a special section devoted to Chinglish signs. @WilldrawsRainbows – Or back to whatever his or her real job is supposed to be…@murisopsis – And with minimal hair, scalp irritation is a real possibility! =D@TheLatinObserver – So rarely do I engage in these sorts of “Isn’t it bizarre” posts, but I didn’t want to miss this opportunity. @CurryPuffy – Phut geng khrap. @Roadlesstaken – Do you? Really?! Please explain it to me, Alex. Pleeeease!!! @chow@ireallylikefood – Now, THAT would have been really funny. @Justin_DeBin – @elelkewljay – @Dezinerdreams – @yang1815 – It is one of those situations where words really escape you, isn’t it? Although it looks like all sorts of words were escaping the translator, too. @Redlegsix – Exactly, neither Thai nor English. @TheCheshireGrins – I spent some time trying to work out what it might mean. My guess is that “Car Class G” might mean “Car Park, Ground Floor”. 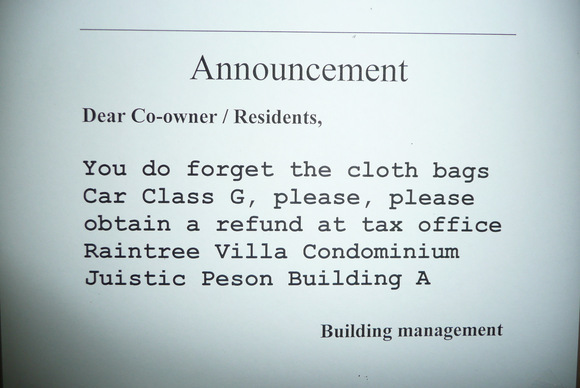 I imagine that “refund” is meant to “pick up” or “receive”, so the overall message is that if you are the person who left a cloth bag in the ground floor or the car park, please come claim it at the building’s juristic management office. That took me three days to figure out, though. @moptoplop – Indeed they do. @BabyBuddhist07 – Nope, live in Bangkok. Just went on holiday in Phuket a few weekends ago. What made you change your mind about living there? That is funny. Some places in India also have signs that are laughable, if not totally confusing. @WilldrawsRainbows – Oh, no, you didn’t sound insensitive at all! I was just trying to build on the joke. Sorry for any misunderstanding. @ZSA_MD – Hmm… so much for the Queen’s English, eh? @ZenPaper – That’s very funny, Evan! lol, I couldn’t make heads or tails of it. It was all gibberish!